It’s little wonder then, that the concept of Sensory Play is now recognised as one of the most important methods of educating all children from a very early age, playing a crucial part in their development. Sensory Play includes any activity that will stimulate any one or all of a child’s five senses, so as to help them develop and refine the use of those senses. All children need help learning how to use their senses. From birth, they explore the world via their senses, touching and grabbing at everything and putting pretty much anything in their mouths! As they grow and move on to formal education, right through the stages from Early Years Foundation Stage, to Key Stage 1 and continuing on to Key Stage 2, Sensory Play forms an essential part of their learning. It helps to build nerve connections to the brain, improving cognitive growth and encouraging children to develop motor skills to carry out day to day tasks. It will help to improve handwriting. 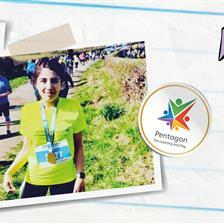 It can help to develop and enhance memory and improve a child’s problem solving skills. It helps children to develop their speech and language through engaging with their environment. 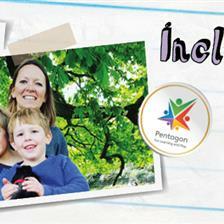 It can help with social interaction and aid children in engaging with their peers. Children will learn sensory attributes and how to react to them, for example whether something is too hot or too cold. It is a brilliant way of calming an anxious child. So if a child with Special Educational Needs is open to tactile learning, then teaching them in an environment where they have plenty of opportunity for Sensory Play will encourage their individual development. An example of this is handwriting. Making marks on a tray filled with sand, manipulating play dough to form shapes or transferring water and other materials between containers helps to develop fine motor skills so that the child can go on to grasp and control a pen against a piece of paper. 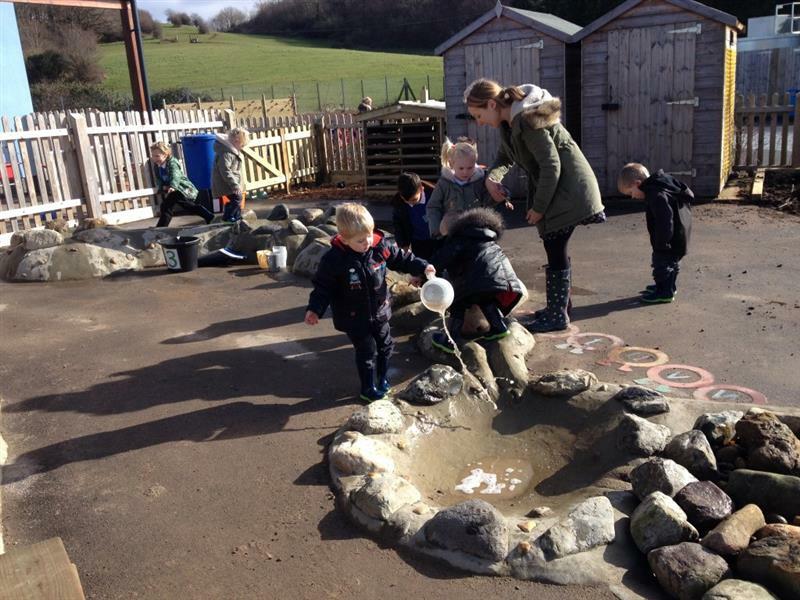 Playing alongside their peers in a natural environment allows social relationships to become more natural, as the children are engaged in activities at their own pace and in their own way without the pressure of a particular defined outcome. Some children with Special Educational Needs will be less comfortable with tactile learning. If that is the case, there are plenty of other sensory stimulants, colours, sights, sounds and smells that they can experience. As they become more comfortable with these and their surroundings, they may be encouraged to go on to try tactile learning too. So, how to promote Sensory Play? It is important to recognise how an individual child’s needs can best be met and what they best respond to, particularly for a child with Special Educational Needs. Incorporating various forms of sensory play into a child’s day every day, offering them opportunities to discover the world around them in interesting, stimulating and exciting ways, means that they will have some of the best learning experiences possible and a greater chance of success whatever their ability. It is fair to say that almost all environments are “sensory” in one way or another. But there are some that are more “sensory” than others. In our view, the very best sensory environment is the great outdoors. Nature. As Richard Louv so rightly says “When you’re sitting in front of a screen, you’re not using all of your senses at the same time. Nowhere than in nature do kids use their senses in such a stimulated way.” Step outside and nature is all around us. There is so much for them to take in. If you don’t have direct access to a natural sensory environment, or it just isn’t practical to take your class out to such environments on a regular basis, it doesn’t end there. It’s not hard to create your own outdoor sensory environment within your own grounds, even if you only have just a little bit of outdoor space. In creating a sensory outdoor space for children with Special Educational Needs, you will need to consider the broad range of challenges experienced by them, and the options available to you in terms of space and resources. Many of the issues faced by children with Special Educational Needs, can be accommodated if your outdoor space is designed to offer a range of sensory experiences in a thoughtful, creative, imaginative and inclusive way. It doesn’t matter how big or how small your outdoor space is. Whether you have a small courtyard or a giant field, you can transform it into a sensational sensory playground for your kids! Do your school grounds have an empty, long forgotten dingy corner that nobody uses? If you look, most places do. Why not turn it into a sensory garden and make the most of your outside space? A Sensory Garden is defined by a concentration of different experiences. Some areas can be more relaxing, still and calming, whereas others can stimulate activity and can be used in conjunction with educational programmes. 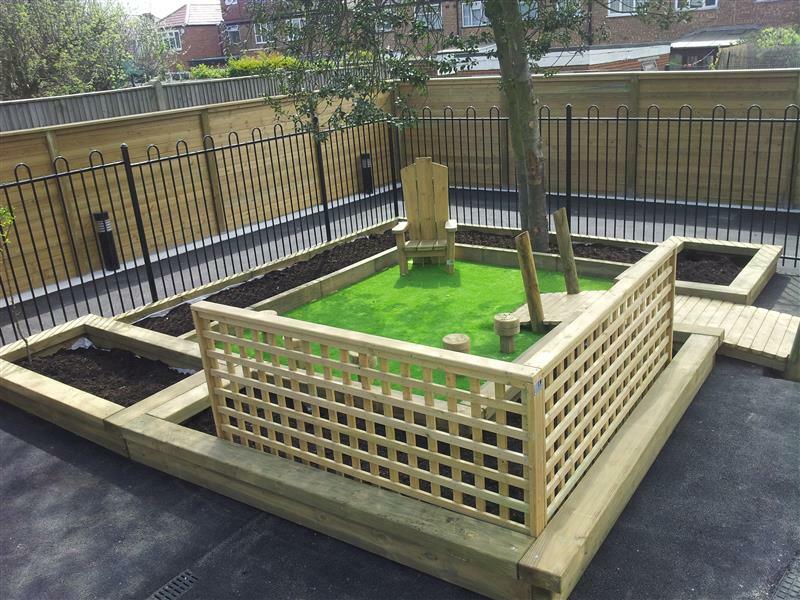 The sensory garden could be small and self-contained, or even form part of a larger outdoor sensory space. If you are lucky enough to have a larger outdoor area at your disposal, you can create a Sensory Trail. This will provide a range of different experiences along its route, offering more opportunities for movement and orientation. You can create themes to connect each experience, or each experience can be used to inspire interest in its own right. Consider How the Sensory Space will be used. 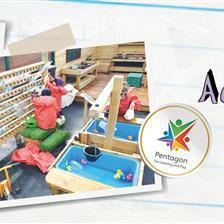 What are you looking to achieve from your sensory space and what would you like your children to be able to do there? If the garden is mainly for children to relax, particularly if they need a quiet calm space, make sure you incorporate plenty of seating and quieter areas with plants to break up the space or provide screens. 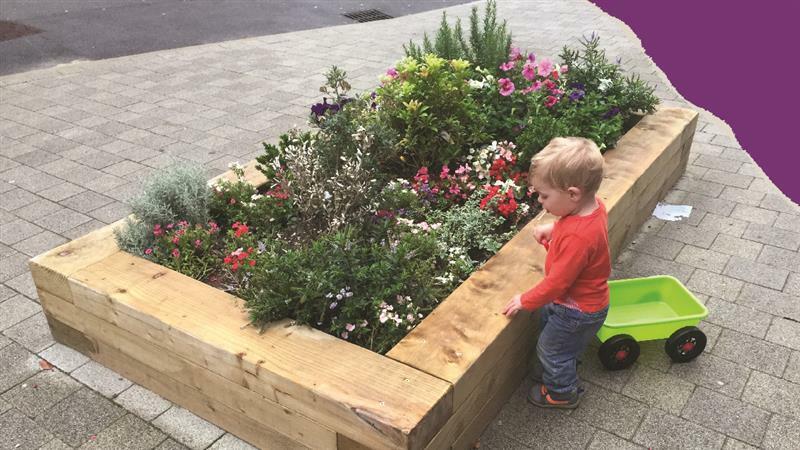 If it has an important social focus, to encourage social relationships, then include things that bring children together such as a digging or gardening area. If there is a strong educational focus, you can include elements that link in with the school curriculum in a more informal way, to encourage for example counting, open discussion and use of language. Consider access and orientation, and make accessibility part of the Sensory Experience. If children with different Special Educational Needs are to enjoy the garden, they will all need to be able to get to and around it. Consider the surface, gradient and width of paths and whether they can be accessed by a wheelchair. Provide a clear edge along pathways so that visually-impaired children are aware of the edge of the path surface. Remember that paths in sensory spaces can do much more than just providing access. Changes of direction and gradient, bridges and tunnels, colourful markings and the focus of an end destination all add to the sensory experience. Different surfaces and markings rather than a plain tarmac or grass surfaces can all make a big difference. Why not lay a colourful, shapely Safeturf Hopscotch, Snake or Caterpillar for children to travel between areas of the sensory space? 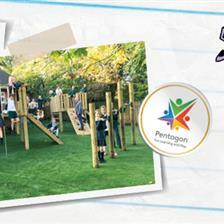 You could lay Safeturf to protect children from falls or Playturf in areas that are prone to becoming muddy. Orientation skills can be improved by providing things for children to stand on or climb up. Logs, tyres, bridges, balance beams and ropes can all be incorporated into a Trim Trail which provides children with a variety of different physical challenges that test and develop balance, upper and lower body strength and gross motor skills as well as providing essential exercise. They can act as great markers in the landscape and can offer a stimulating transition from one part of the sensory area to another. They can be incorporated into more educational lesson plans including maths, literacy and science, and to introduce concepts such as up and down, high and low, over and under. Always consider access in terms of a child’s ability to reach out and touch specific features within the sensory space. Whether you are using plants, water, sculptures or activity stations, make sure they are placed at different levels both high and low so that they can be reached by all. Good sensory design will ensure that different experiences are within reach for different children. For example, some plants and trees may be planted deliberately close to a path rather than set back, and at lower and higher levels so that those in wheelchairs can also easily touch them and feel the different textures. Some children with Special Educational Needs are uncomfortable with change and surprise can create anxiety. By making sure that different activities or experiences within your sensory space are staggered, and even including some signage or an orientation map, can help them to anticipate the changes and feel more comfortable. Visual aids and signage can also help them to communicate with others. Comfort is very important and can easily be overlooked. Outdoor Seating is an important feature of landscape design, making a sensory space more accessible to children who tire more easily, or who would like a chance to pause and become comfortable with their surroundings. There are many different types of outdoor seats available depending on what purpose you are looking to achieve. A simple wooden Perch Bench placed at the side of a path, next to a planted area, under the shade of a tree or at the top of a viewing spot, creates a great spot for a quick quiet rest to take in the different sights and sounds. A Picnic Bench is a lovely way to bring children together for a snack in the fresh air. A colourful Mushroom Seat or a Picnic Bench with a Game Top adds a sense of fun and a different focal point to the sensory experience. A Tree Seat built around an existing tree brings children closer to nature and allows comfortable access to feel the texture of the bark and to look up at the light reflecting through the leaves. Or what about a Storytelling Circle that brings lessons and discussion/storytimes outside into the sensory space? 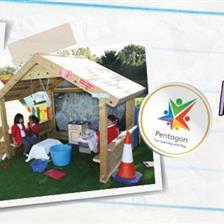 Shelter from the sun, wind or rain in your sensory playground is important. In the sunlight you can create a range of shade, from solid to dappled, so that children can choose what best suits them (this is easy if you have plenty of trees!). Gazebos and Timber Canopies provide solid shade and make for more flexible use whether as an outdoor classroom or as a quiet area to sit, relax and read, and to feel safe. They can provide soothing areas where children can to escape to if they are feeling overwhelmed, or where they can watch activities from a distance until they feel comfortable enough to participate. Well-placed trees, plants, hedges and Trellis Screens can help to break up larger spaces making them less intimidating and offer a huge range of different sensory experiences at the same time. You can hang hammocks or Swings to create a sense of comfort by being held tightly by something, or being soothed by the swinging motion. An essential aspect of the design is thinking about what range of experiences will be available in your sensory area. We have already mentioned the use of pathways and access as part of the sensory experience but good design relies on imaginative use of materials and opportunities. You can encourage natural experiences, for example, by installing a Wildlife Area, introducing nest boxes, a Bug Hotel, feeders, or nectar rich plants to encourage birds, butterflies, mini beasts and creepy crawlies. One of the most essential components of an outdoor sensory playground is the use of plants, and the idea of engaging children in gardening activities which can help to increase fine and gross motor skills, body awareness, and motion in addition to providing a calming connection to nature. Gardening is a brilliant way to familiarise children with different textures, sights and scents of plants in a controlled manner, whilst keeping them engaged in their sensory space. Sight - through different colours and shapes, plants offer a complete spectrum of colour with the joy of changes throughout the different seasons. Include flowers, leaves, bark, berries, and grasses in your plans to create interesting colour and shape effects throughout the year. Smell - there are so many plants that have distinctive and interesting smells, you can’t really go wrong! Some, such as honeysuckle, fill the air with their scent as you walk past them. Others such as roses need to be investigated more closely, and some release scent when you crush them between your fingers (lavender for example). A herb garden with varied herbs such as rosemary, thyme and peppermint offers a medley of scents and textures. Touch - when children explore with their hands they get to appreciate the real nature of things. How soft the petals are, how smooth or squashy the fruit is, how dry the grass is and how rough the bark is. For all sensory explorers the opportunity to touch as many of the sensory delights on offer as possible is important. Again, choose plants with interesting textures in their flowers and leaves, with berries, with seeds, and with different textured bark. A sensory space should be full of different textures and children with visual impairments in particular may rely on these to interpret their environment. Taste - engage the children in growing fruit and vegetables in a raised and easily accessible Planter. Easy to grow fruits such as strawberries are so delicious and there’s nothing as tasty as eating them outdoors! It will also help children understand the importance of healthy eating in a climate where child obesity is a current problem. There’s nothing better than picking and eating the scrumptious vegetables and fruit which you have proudly grown yourself. To make your space extra sensational, you could include some special features or apparatus either as a focal point in the centre of the space, or set aside in a specific sensory activity area. Water is an awesome sensory element to engage all five of a child’s senses. You can include stationary water with options to dip hands or float objects in a Water Table. Even better, moving water which moves through a series of pools or funnels creates added visual and audible interest and options for water play. Have you ever noticed how things smell different when they are wet? Soak some grass and give it a try! A Water Wall, with freely positioned water channels and moving parts, high and low water reservoirs, and tubes and hand pumps for getting the water going, can be a really valuable tool for many different education programmes. Children can pump the water from the bottom reservoir to the top, then watch it pour out into the water channels and spin the water wheel, thanks to gravity, along whatever route your children have assembled. This makes for a wonderful sensory experience with the therapeutic sounds of splashing and rushing of running water, which can be stimulating or calming depending on its pace. Even better, it is a great fun aid to teaching science and the water cycle, source to mouth, cause and effect, water recycling, kinetic energy, flow and gravity, balance and equilibrium, mass and weight of materials (water and plastic), and more! 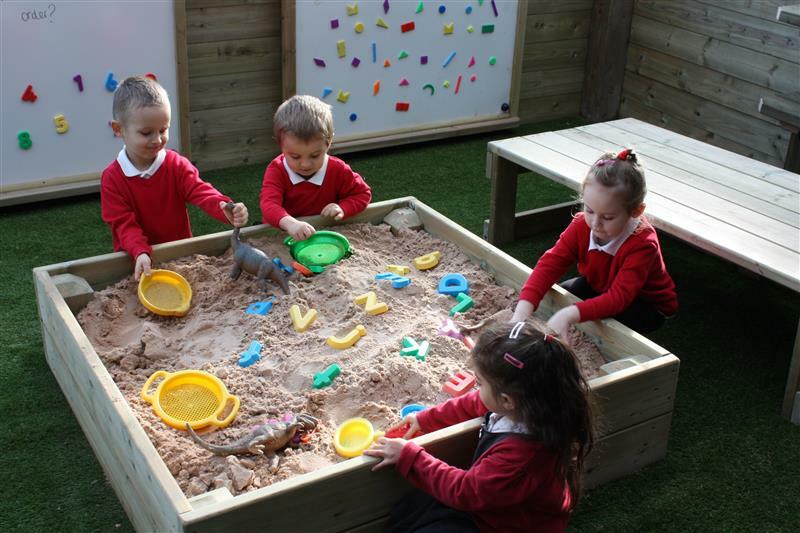 Include a sensory play tray in your sensory space such as a Sand Table, Tuff Spot Table or a Mud Kitchen to engage numerous senses, and create an inviting, calming and tactile stimulus for children of all abilities. Fill them with grass and leaves, sand, foam, toys, cooked spaghetti, anything with different textures and scents or that makes interesting sounds as it is manipulated, to create a platform for all learning abilities to enjoy open-ended sensory play. Listening activities are a good way of calming children and helping them to tune in to their environment. They can be stimulating or relaxing depending on the source and the environment. Children are often so busy with whatever it is that they are doing, that they need to be asked to pause and encouraged to listen to the sounds around them, especially more subtle ones (and especially their teacher’s voice!). In a well-designed sensory space there will be many different sounds that occur naturally. Leaves rustling on a breezy day, water pattering and splashing on different surfaces or rushing down a stream, birds singing, insects buzzing, the list goes on. You can encourage children to tune in to what is going on around them by asking them to stop and listen, then describe what they can hear. Musical play opens up even more options to experiment with sound and work on a child’s ability to listen. Children with hearing difficulties may be able to sense vibrations and so should always be encouraged to participate too. Install some Musical Play Equipment into your sensory space to enhance the sensory experience. Wall Mounted Chimes can be installed even in the smallest of sensory spaces and will entice children to gather around and make interesting and beautiful sounds. Colourful African Drums, a Glockenspiel Panel or a Tuned Xylophone are fantastic outdoor instruments to create percussive sounds and vibrations for a multi-sensory experience. To create exciting, thoughtful, and engaging outdoor sensory playground spaces for all children and especially children with Special Educational Needs, gives them a wonderful opportunity to have fun whilst learning, away from the classroom but in a safe and engaging environment. 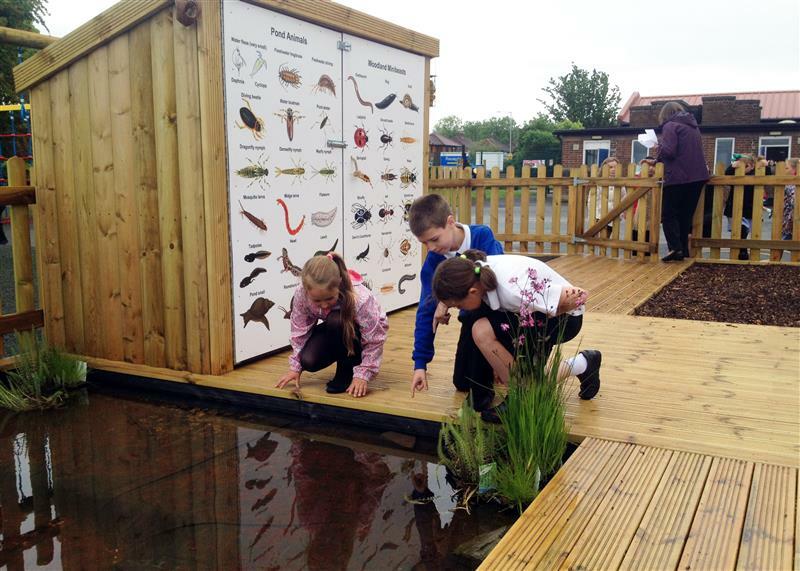 If you would like to explore our website, we have plenty of fantastic sensory outdoor equipment designed specifically for EYFS, Key Stage 1, Key Stage 2 and Special Education Learners. Feel free to view our work at Fox Wood and Green Lane Special Schools to see how we enhanced their playground areas or Contact Us to discuss potential ideas for your school playground.